Hazel and I both love using the Moby Wrap to carry her around in. She’ll fall asleep, and there’s nothing as sweet as a sleeping child snuggling with me. Since being home from New York, I’ve missed all the babywearing time that we had–we just aren’t out and about as much. We also got an Ergo carrier. I’d heard nothing but raves about it, and I thought it would be more practical in some instances. Also, since it can be used as a back carrier, Conner could carry the kids around if needed (which probably will be needed in a couple of weeks when I’m at my training in Atlanta and he’s with the kids all day in Atlanta!) on his back. 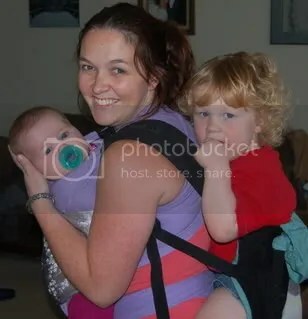 The Moby works as a back carrier too, but it is a bit feminine for Conner to wear (being lilac and all). Just for fun, I wanted to see if I could be a Mommy camel, and was able to wear both kids at the same time. It would have come in useful during some of our day trips in NYC! Today, I had Hazel in her Moby again, and was riding on the bus. A sweet old lady got on the bus and asked “Is that a baby in there?”. Dumb question, but she was old, so we’ll move on and not mock her. Especially since when I said yes she looked absolutely delighted. Um, hello?! First of all, you’re saying that you thought that me + baby was just me? How big and misshapen do you think I am? Second of all, I had a HAT on Hazel. A freakin’ hat! No, I generally don’t walk around calling attention to my misshapen tummy fat by covering it with a sweet brown-and-pink paisley HAT! Idiot woman. What is wrong with people? Think before you speak, folks. Walking around the city, I usually carry Hazel in a moby wrap (the lilac Moby D, to be exact). I get tons of compliments on it, and people often stop me to ask me where I got it, either because they want one themselves or they want to purchase one as a gift for a pregnant loved one. Uh… what do you say to that? I mean, she hasn’t expressed her comfort directly–her current vocabulary consists of ‘ahhh’ and the regular belch. But she does fall asleep in it, and when she got tired of being all tucked into it (one of the newborn holds), she would fuss in it. So, I assume she’s comfortable.